Ch 33-1 1. careful analysis of ancient written records. 2. fossil analysis. 3. radiometric dating of its oldest rocks. 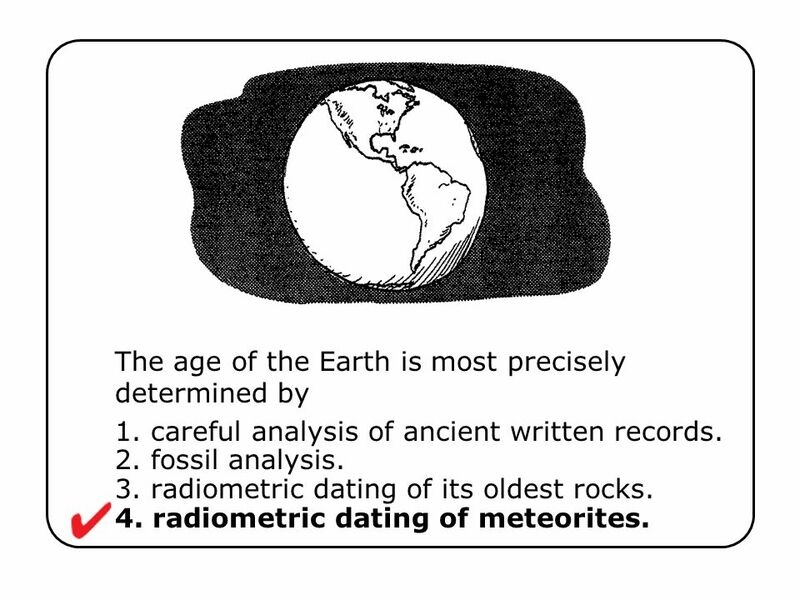 4. radiometric dating of meteorites. Ch 33-1 Answer: 4 Why don’t geophysicists simply date the oldest rocks? They do, but the oldest rocks don’t go back to the earliest periods of the Earth’s past. Like chunks of ice melting and solidifying in an ice floe, solid rock today was yesterday’s molten magma, and much of today’s molten magma will be tomorrow’s solid rock. So early rocks are no longer found on the Earth’s surface. But while the Earth was newly formed, so likely were meteorites— which have not undergone subduction into a molten interior. So oddly enough, our best estimates of the Earth’s age come from outside the Earth altogether! 1. careful analysis of ancient written records. 2. fossil analysis. 3. radiometric dating of its oldest rocks. 4. radiometric dating of meteorites. 3 She bathes in the warmth of a natural hot spring located in the quiet and peaceful mountains. Interestingly enough, the spring water is warmed by Ch 33-3 1. fires beneath the Earth’s surface. 2. the Earth’s own natural heat. 3. solar power. 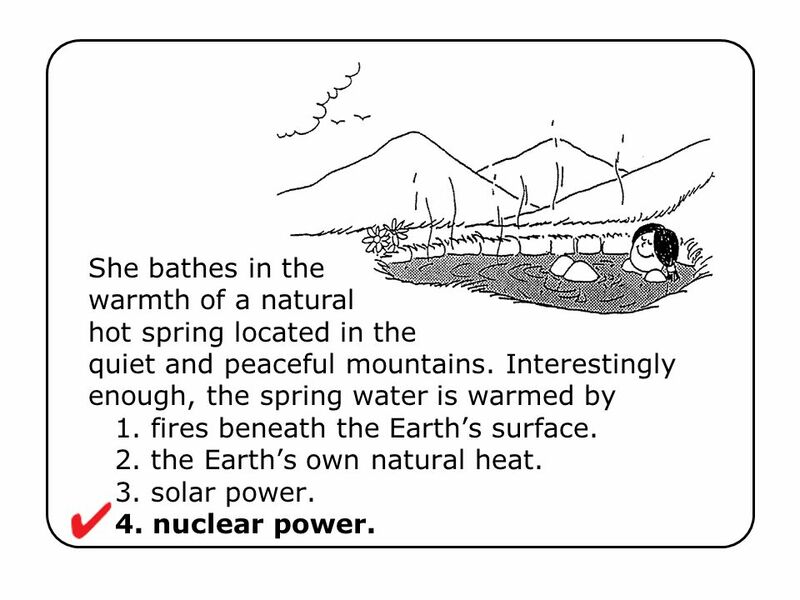 4. nuclear power. 4 She bathes in the warmth of a natural hot spring located in the quiet and peaceful mountains. Interestingly enough, the spring water is warmed by Ch 33-3 Answer: 4 The spring is warmed by nuclear power—not from nuclear power plants that generate electricity—but from the natural radioactive decay of atomic nuclei in the Earth’s own interior. Radioactivity is a major source of Earth’s “own natural heat,” which produces hot springs—and geysers as well. This doesn’t mean that hot springs and geysers themselves are radioactive. Their thermal energy is simply a byproduct of nuclear decay deep beneath the Earth’s surface. 1. fires beneath the Earth’s surface. 2. the Earth’s own natural heat. 3. solar power. 4. nuclear power. 5 1. 2865 years. 2. 5730 years. 3. 11460 years. 4. 17190 years. 6 1. 2865 years. 2. 5730 years. 3. 11460 years. 4. 17190 years. 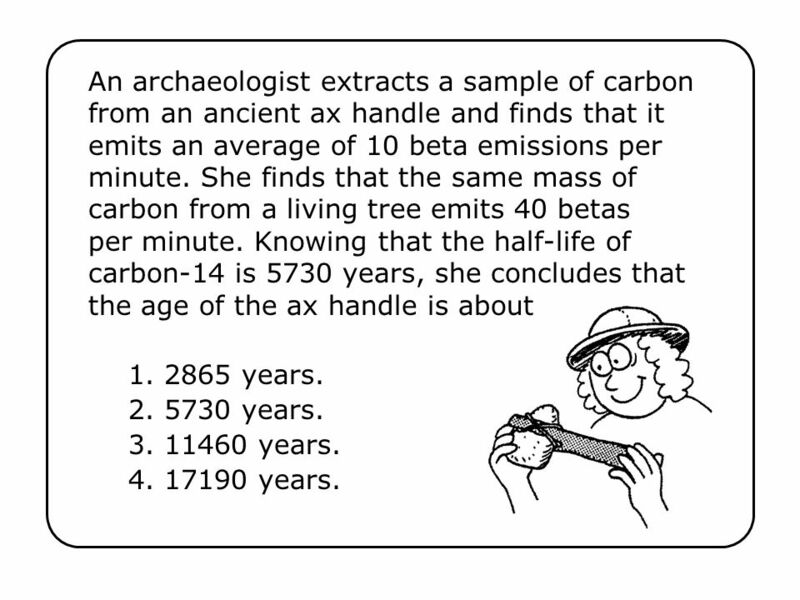 An archaeologist extracts a sample of carbon from an ancient ax handle and finds that it emits an average of 10 beta emissions per minute. She finds that the same mass of carbon from a living tree emits 40 betas per minute. Knowing that the half-life of carbon-14 is 5730 years, she concludes that the age of the ax handle is about years years years years. Ch 33-4 Answer: 3 Two half-lives of carbon-14 is years. When the ax handle was new, it would have emitted 40 betas per minute for the amount of carbon tested years later it would have emitted half this rate, 20 betas per minute years after that, two half-lives, it would emit half of this or 10 betas per minute. So the ax handle has been emitting beta particles for two half-lives or years. Download ppt "The age of the Earth is most precisely determined by"
Radio-Carbon Dating NZQA All living plants and animals contain carbon. All carbon contains a known proportion of the radioactive isotope carbon-14. IV. Isotopes 2 or more atoms of the same element having the same number of protons BUT different numbers of neutrons. Radiometric Dating Journal Entry #5 Continued. Radiometric Dating The process of determining the age of fossils by measuring the relative concentrations. EARTH HISTORY Chapter 6 review. Absolute Dating Shmulik Marco and Neta Wechsler. Relative dating. Topic: Absolute Dating Absolute Dating is the real, true age of the rock.